Half the fun of seeing a painting in person is getting up close to each brushstroke, seeing the little touches that wound up making a greater whole hanging on the wall. The problem, however, is that getting up close and personal with humanity's greatest artworks cost a fortune in airfare, museum tickets, or planning cunning heists (à la The Thomas Crown Affair). Thankfully, that's about to change, as the Google Cultural Institute has a new way to appreciate art - a high-power gigapixel camera designed to bring the museum experience directly to your computer screen. The Google Art Camera can take multiple high-resolution closeups of artwork - each image containing over a billion pixels - that are then stitched together into one image that can be zoomed down to the individual blot of paint or crack in the canvas. Not only does the Art Camera make appreciating art from home a lot easier - seeing Van Gogh's Roulin Portraits, for example, would require some serious globetrotting across three different museums, but are now available to view online - but it could also help preserve works for future generations. Paintings are sensitive things, especially to heat and humidity. Flash photography is a risky bet, and carting them around to world for others to enjoy is even more likely to wear down on the work's lifespan - if not open it up to the aforementioned movie-style heist. 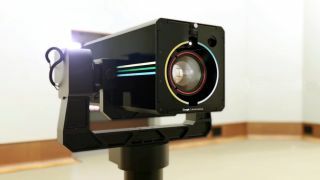 The Art Camera uses a system of lasers and sonar that measures out an exact distance between it and the artwork, allowing it to focus its lens more accurately and ensure great detail without subjecting it to being put in a scanner, excessively bright light, or otherwise messing with the original piece. Up until now, producing gigabit-resolution recreations of art was extremely time-consuming, with Google admitting that only 200 works or so were photographed over the last five years prior to the Art Camera. In preparation for tomorrow's International Museum Day, the Google Cultural Institute has opened the floodgates on its high-res art collection, containing some must-sees ranging from Rembrandt to Monet. Now, excuse us while we have our own poignant moment of reflection via staring deeply into the works of the masters, like Cameron in Ferris Bueller's Day Off.